The weather forecast wasn't great, but I was tired of waiting to do a long hike and would pay for it with battered toes, but no matter - I had great fun anyway. I had spent the night camped in the van in Pukalani, a moderately-sized town in the upland area below Haleakala, at around 1,500ft. It had been raining on and off during the day and I found what I thought was a secluded, empty dirt lot across from the CVS store. I was visited by Maui's Finest sometime after midnight, a portly samoan-type who was friendly enough, but told me I couldn't spend the night on private property (never mind that there's no signs/fence, etc). He told me the lot is often used by "drug people" and wouldn't want me to be bothered by such miscreants. He went on to suggest I could park in the CVS lot which I proceeded to do before going back to sleep. Note to self: avoid parking in town. I was up early and drove up to the Visitor Center in Haleakala NP at 9,700ft and the trailhead for the Sliding Sands Trail. It was raining lightly and very windy and cold so I promptly went back to sleep for another few hours. By the time I had awaken a second time, the parking lot was mostly empty, the sunrise folks and bike vendors having called it a day with the inclement weather. Having been skunked a few days earlier, I decided to brave the elements regardless - who knows, maybe I'd get lucky with improving weather (it was forecast to be sunny the next two days, so it wasn't just wishful thinking). I drove up to Red Hill to tag it for the second time this week, came back to the Visitor Center and tagged Pa Ka'oao (shameless stat padding since I'd visited these already), then set off down the Sliding Sands Trail shortly after 10a - no early start, to be sure. The Sliding Sands Trail drops 2,400ft to the bottom of the crater over the course of about 4mi. I intended to take it only a short distance before diverting cross-country to the South Rim where I planned to tag some of the summits that stretch out along the 5mi ridgeline. How far I would get would largely depend on the weather and the terrain - driving rain would be bad, but crappy lava rock could also be a problem. I was happy to find the rain stop for the most part as I left the Visitor Center, though there would be occasional showers along the ridge and clouds much of the time. I had left the regular camera in the car because of the weather, using my GPSr's camera as the backup for the day. No zoom and other features, but at least waterproof. I left the trail after about a mile, making an ascending traverse to the southeast to eventually intersect the South Rim in about 3/4mi. I found the ridge to be comprised of fairly solid lava rock for the first half, then a mix of sandy gravel and rock on the second half. The first made for slow going as I wandered along the ridge at a modest pace, but the sandy gravel was a welcome change that made for faster progress for the short stretches I could take advantage of it. I reached the first summit, Haupa'akea Peak around 11:30a, though with only about 60ft of prominence it's little more than a bump along the slowly descending ridgeline. The clouds enveloped the summit so no photos, sadly. I continued east along the ridge, noting the terrain change gradually from almost barren rock to more vegetation the lower I went. Clouds keep the ridge wet much of the time, but the ground is very porous and can't hold much moisture. The plants are very hardy and grow slowly here, and I did my best to avoid stepping on them or breaking branches. It was nearly 1p before I had covered the nearly two miles to the second summit, Kumuiilahi. Again, very low prominence but a little more interesting. There are two closely-spaced points and I visited both, not really sure which is higher. There was some easy class 3 scrambling (probably class 2 ways if one looks) that was somewhat interesting, but the clouds once again spoiled the photo ops. The feature is found very close to a saddle along the ridge before it starts climbing more than 600ft to Peak 8,432ft. I managed a photo of the much higher peak from near the saddle before the clouds took hold again. The rain had pretty much stopped by this time, a welcome relief. I had been stopping regularly to change in and out of my rain jacket and fleece, but kept the rain pants on because of the wet vegetation. My feet were thoroughly soaked by now and would slowly start to blister and turn red, pretty much as expected. At least I wouldn't get trenchfoot. I reached the top of Peak 8,432ft around 1:45p. It was odd that despite its considerable prominence it had no name when the Hawaiian tradition seems to be to give every small cinder cone the honor. I could not see the last peak along the ridge, Haleakala, but knew from the GPSr that it was little more than mile to the east. I made some calculations to know that it would be dark before I got back if I continued. This wasn't really a problem since I had a headlamp with me and had gotten a late start so had plenty of energy. The trouble was my feet which would already be raw before I got back and could only grow worse by stretching the day out. I decided to head back. Heading back actually meant heading down because the fastest return would not be the way I'd come, but rather dropping to the crater floor and taking the Sliding Sands Trail back. The north side of the South Rim is steep and moderately heavy with vegetation, but with careful route-finding I was able to keep things reasonable. I had to do some wandering higher up to get through some cliffs, then favored a gully (thankfully dry) for much of the way down before finding easier going near the bottom on more open slopes out of the gully. In all I spent about 40min descending the 1,200ft to the crater floor where I picked up the Sliding Sands Trail. The descent had gone much faster than I expected and I found myself looking for some extra summits to tag on the way back. The crater is littered with cinder cones, more than a dozen named ones, a few of which I had climbed two years earlier. I planned to come back the next day to specifically tag many of them, so I picked out four that I could do today to make the next day's effort a little easier. From the Sliding Sands Trail I followed another trail northwest from a junction that headed to a saddle between two of the cinder cones. The first of these was Halali'i, a grayish pile of gravel that made for a tedious ascent but had a remarkably colorful crater that contrasted with its drab exterior. 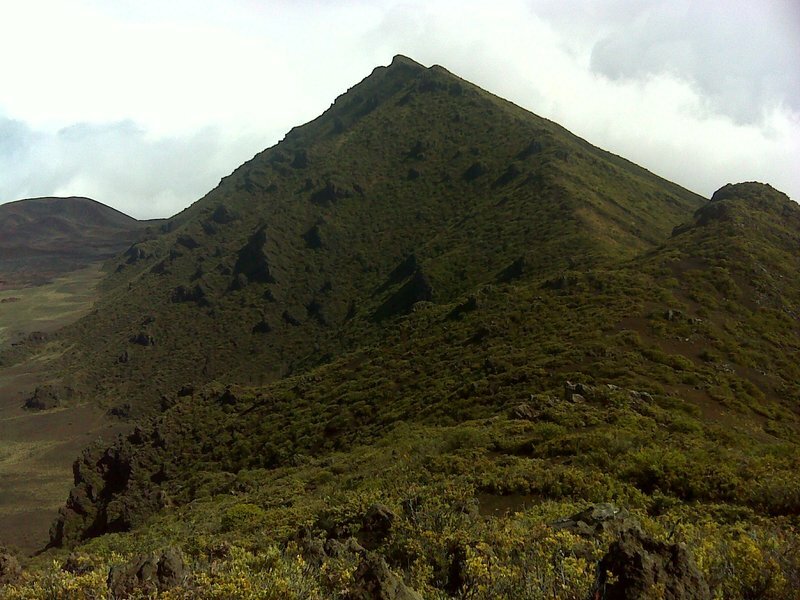 The second was Kamoaopele (lots of these cones are named for Pele, the goddess of fire in Hawaiian lore), a brownish-red cone higher than Halali'i but a little easier to climb since the trail rises to a higher saddle on the north side where the angle of Kamoaopele's cone isn't so bad. As I was taking a few crappy photos from the top, I noticed a number of interesting lava outcrops below to the southeast. I decided to drop down in that direction and climb the highest of these with a short bit of fun class 3 on the upper pinnacle. This bit of fun concluded, I returned to the Sliding Sands Trail and began the long, 4mi climb back up to the Visitor Center, stopping halfway back to tag Pu'uopele, just north of the trail. With the sun making an appearance towards the end of the day, I took photos of a pair of tomorrow's objectives, Kama'oli'i and Pu'uomaui. The weather continued to improve as I finished the climb back up to the TH, a good sign that the forecasted good weather was arriving, even if a little late for today. It was after 5:30p and sunset by the time I returned, fairly tired.